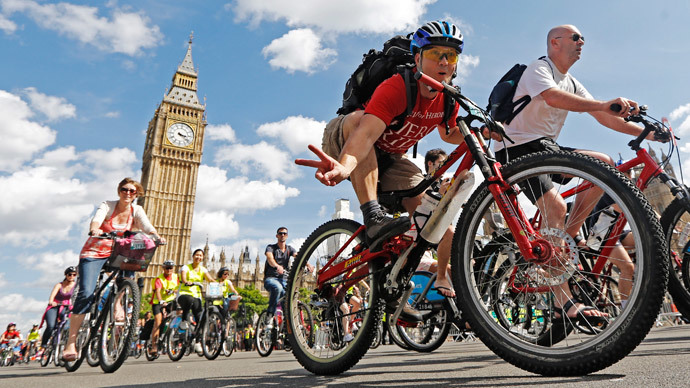 London Mayor Boris Johnson has approved the construction of two ambitious cycle routes spanning the capital. The lanes will become Europe's longest substantially-segregated urban cycle ways. The bike lanes are the centerpiece of a wider £900 million project to boost cycling in the capital. One lane will link north to south, while the longer and far more contentious one snakes east to west. The plan is to establish a single segregated cycle lane from one of the busiest roads in central London along the Embankment, linking Hyde Park with Tower Hill, passing through areas including Victoria Embankment and Parliament Square. The north-south route will run from Elephant and Castle to King’s Cross. During consultation, concerns were raised over the potential congestion the cycle ways could cause by reducing the number of car lanes. However, 84 percent out of 21,500 respondents to the scheme backed the plans. “Overwhelmingly, Londoners wanted these routes, and wanted them delivered to the high standard we promised,” Johnson said in a statement. “But I have also listened to those concerned about the east-west route’s impact on traffic … we have made changes to our original plans which keep the whole of the segregated cycle track and junctions, while taking out much less of the route’s motor traffic capacity,” he added. Cycling is becoming increasingly popular in London. While vehicle traffic has dropped by 25 percent in the last decade, the number of cyclists has doubled, according to the Greater London Authority. If everything goes to plan, Londoners will have around 20 miles of new, almost entirely segregated safe cycling routes by spring 2016. The new cycle routes will complement London's four existing Cycle Superhighways, intersecting at Blackfriars. The mayor's office said each of the new routes will have the capacity for 3,000 journeys per hour.